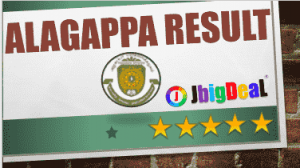 Alagappa University Result 2018 UG and PG Exam is announced on www.alagappauniversity.ac.in. However, candidates may also check Nov/Dec and April month DDE (Distance Education) and Regular UG/PG courses and Collaborative Programmes, Affiliated Colleges results online at www.alagappauniversity.ac.in 2018. Alagappa University is a public university located in Karaikudi, Tamil Nadu, India was founded by Alagappa Chettiar. Alagappa University was brought into existence by a special Act of the state government in May 1985.